Day 7 of the 2015 PokerStars and Monte-Carlo Casino European Poker Tour (EPT) Grand Final featured the start of the €25,500 High Roller, as well as Day 4 of the Main Event. 34 people came back to the felt on Wednesday, looking to make the final two tables before the end of play. 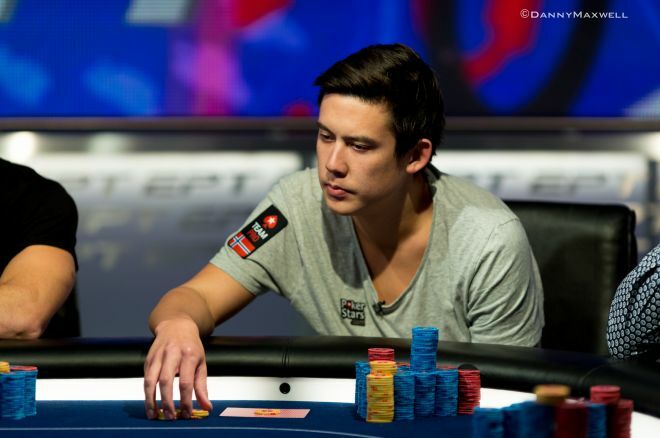 EPT Veteran and Team PokerStars Pro Johnny Lodden ended the day as the only player with more than two million chips. His 2,293,000 is nearly half a million chips more than second-place stack, Germany's Markus Ross with 1,815,000. Spain's Adrian Mateos sits in third spot, bagging 1,635,000. Other notable players who bagged chips at the end of the day include Day 2 chipleader Ole Schemion (1,178,000), Day 1b chipleader Romain Paon (782,000), and Day 3 chipleader Jose Carlos Garcia (523,000). Canada's lone player on Day 4 was Ryan McEathron. He started the day with 521,000 but couldn't make it to the end of the day. McEathron lost most of his stack in a bad beat with against , but it was Connor Drinan who finished our man off. McEathron got his final 16 big blinds in with suited connectors, only to run into Drinan's black queens. He collected €34,400 for his 27th-place finish. Other notable cashes from Day 4 are below. The €25,500 High Roller got under way on Day 7, playing 10 one-hour levels. Allowing a single reentry, the tournament attracted 160 people with 40 reentries already, for a total of 200. Registration and reentry is open until the start of Day 2, so the total is sure to rise. 94 people still had chips in front of them at the end of Level 10, with Steve O'Dwyer at the top of the heap with 330,200. Tony Gregg and Max Altergott are the only other players over 300,000, bagging 325,800 and 311,100 respectively. Canada is well represented going into Day 2 with Daniel Negreanu leadeing the way at 182,000. Other Canadians who bagged chips are below. Notable non-Canadians to bag chips include Matt Waxman (298,500), €100,000 Super High Roller runner-up Dzmitry Urbanovich (209,900), Team PokerStars Pro Isaac Haxton (181,700), Scott Seiver (177,700), and €100,000 Super High Roller winner Erik Seidel (149,100). Play on Day 2 will go for 10 levels, or until eight players remain, whichever comes first. The penultimate day of the Main Event kicks off live on EPT Live at noon CET Thursday. Check back tomorrow here with PokerNews Canada to find out the fate of our Canadian high rollers, as well as for an update on Day 5 of the Main Event.